So you've got the perfect apartment, your neighborhood is great and utilities are within your budget. You even managed to choose a roommate who doesn't leave the dishes in the sink until they get moldy! Still, there's a problem: your roommate has a guest that just won't leave. While we've all had friends who need a place to crash for awhile until they get back on their feet, or even a boyfriend/girlfriend that we just can't seem to spend enough time with, it's completely unfair for somebody to invite another person over for an extended stay. It's not fair for you to be exposed to a person on a day-to-day basis when that person didn't sign the lease and put no money towards a security deposit. It can be annoying on a personal level, and it has the potential to put you at risk on a financial level, as well. After all, what happens if your new guest gets mad and punches a hole in the wall? Or, more innocently, what happens if he or she accidentally breaks something? Your landlord isn't going to be particularly concerned with who damaged what, as the money to fix the problem is going to come out of your security deposit, either way. 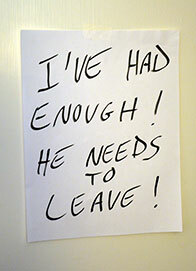 On a more probable note, having an extended-stay guest can be greatly annoying. Why should you work hard to pay your share of the rent, groceries and utilities, only to have this person come in and freeload off of you? Even in the (unlikely) circumstance that the guest chips in for bills, when you signed the lease you signed on to have a set number of roommates, not a single person more. What I'm getting at here is that even under the best of circumstances, if the guest is respectful, chips in for the bills and cleans up after him or herself, you've got every right to be peeved at the situation. So, what to do next? The first thing you should do is talk to your roommate when the guest isn't around. Be honest and forthright about your feelings on the subject. You deserve to be heard out for being inconvenienced by your roommate's thoughtlessness. While it's not a good idea to become overly aggressive, you should definitely get a little assertive and hold your ground on the matter. If it helps, print out this article and bring it with you to the conversation! Remember that the goal of the conversation is to set a time frame for getting the long-term guest out of your shared living space. While it may be frustrating, it may not be reasonable to expect the person to pick up and leave within the hour (or even day). If this is the case, try to set a time frame of two to three days. At the absolute maximum, depending on how "extended" the guest's stay has been, he or she should be out of the house within a week. If you have a good relationship and your roommate is relatively sane, this should be more than enough to get the freeloader out. Still, there's a pretty good chance that the person will come back to the house to hang out. Although it's reasonable for you to ask for the person to stop spending days at a time in your apartment, it's not within your power to outright ban the person from your mutual home (notable exceptions to this rule include stealing, hostility, etc.). Because the person will probably be coming by again, the "kick-out" conversation should end with a rule about how many nights, if any, guests should be allowed to stay.